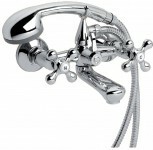 Washbasin mixer with chain. Chromed. Cartridge with ceramic discs. Washbasin mixer with pop-up waste. Chromed. Cartridge with ceramic discs. Shower mixer. Chromed. Cartridge with ceramic discs. 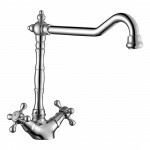 Kitchen mixer with swivel spout. Chromed. Cartridge with ceramic discs. 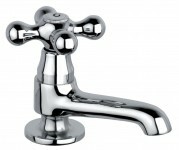 Cold water tap. Chromed. Cartridge with ceramic discs.